HARLINGEN — The driver of a vehicle which crashed Wednesday morning at the 1300 block of South Commerce Street has been arrested and charged with intoxication manslaughter and accident involving death. 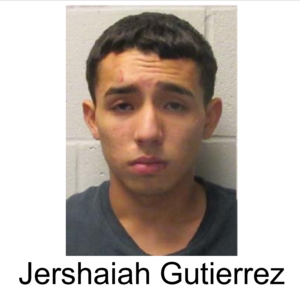 Jershaiah Gutierrez, 17, abandoned the Dodge Challenger and its passenger, Andres Macias, after driving the vehicle into a light pole, according to police reports. Macias was critically injured in the wreck and died after being transported to a local hospital by Harlingen Emergency Services. Each charge carries a $75,000 bond. Records show Gutierrez was charged with a count of aggravated robbery and two counts of aggravated assault with a deadly weapon on Aug. 3, 2016. Further records show he was charged with possession of marijuana on June 6, 2017.